Quasimodo is a deformed man who, as a baby, was taken in by Judge Claude Frollo. Frollo is a harsh, cruel individual who sees sin and debauchery everywhere. 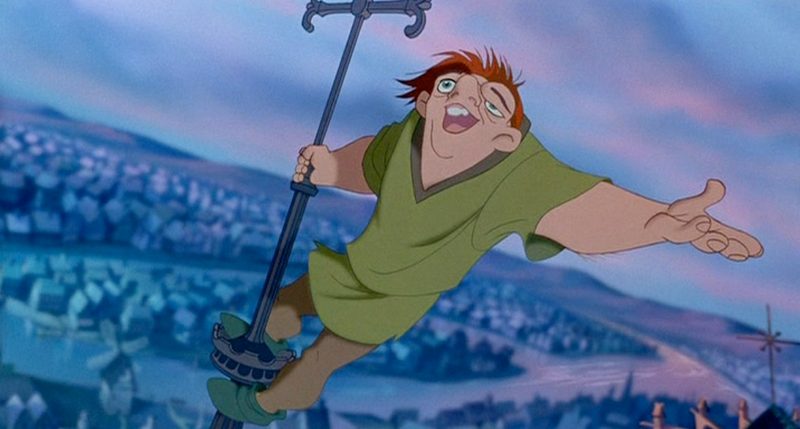 He forces Quasimodo to stay in the bell tower of Notre Dame, as the world will see Quasi as nothing but a monster. Quasi decides to head out and visit the Festival of Fools, where he meets the Gypsy woman, Esmeralda. From there, the story dives into secrecy, double crossing, deception, and heroism. So, honestly, my little description here is lacking as the story is a bit more complex than all that. Really, I don’t think Disney’s ever done a story that delves into some of the stuff this movie talks about. This story gets really dark, with Frollo murdering a woman ON SCREEN within the first 5 minutes of the movie. The many themes of the movie include faith and corruption, loyalty and morality, self-worth and beauty. It gets the audience really thinking about it’s themes. I have nothing for respect for a movie that tries not to talk down to its audience. Also, the movie is amazingly well crafted. The animation work here is some of the best that Disney’s ever animated. It has vibrant use of color and incredible scenery and action (for the most part). The character designs are very unique, especially on the part of Quasimodo. The animators were able to toe the line between “ugly” and “interesting to look at.” He’s certainly no George Clooney, but Quasi’s got an interesting face. The music here is also breath taking. I found myself tearing up at the beauty and passion in most of the songs. (The only two exceptions are Topsy Turvey, which was silly but not that great, and A Guy Like You, which was UGH.) Seriously, this movie’s soundtrack is some of the best that Disney’s put together. I defy you to find a song as epic sounding as Hellfire. That’s not to say this movie is perfect. In my opinion, this movie suffers from 3 major problems. The first, and most obvious, is the gargoyles. What a damn shame. Usually, the comic relief characters are my favorites in Disney movies. These 3 gargoyles are a blight on the name of comedy. All they do is spout catch phrases and distract from the story. They don’t add anything of substance and don’t move the plot along at all. But that’s something everybody has talked about to death. The second problem of this movie is Phoebus, the Captain of the Guards and Esmeralda’s love interest. He. Is. Boring. He isn’t interesting in the slightest. We never learn a thing about his character outside of his career and nobility. He doesn’t change, doesn’t struggle, and doesn’t grow at all in the movie. Not to mention that Kevin Klein sounds utterly uninterested in his performance. Let’s compare Phoebus to Quasi. Quasi is a complex character. He’s constantly fighting with his inner demons, his self-hatred and shame, his loyalty to Frollo versus his dream of being accepted. He has a rich inner life. Phoebus has… a horse named Achilles. Seriously. He’s just boring. Because of this, it felt, to me, that the romance between him and Esmeralda wasn’t genuine. This results in the ending where they end up together feeling unsatisfying. I didn’t care that she didn’t end up with Quasi, I just didn’t think her and Phoebus belonged together. The last thing that doesn’t work is this movie’s slapstick. I was praising the movie’s animation before and I stand by that. However, whenever anyone gets hit in this movie (mostly the guards), it just looks goofy. They pull a funny face and yell a funny yell. The tone of the fighting just doesn’t match the rest of the animation. The animators were trying way too hard to get a laugh from the audience. This kind of goes hand in hand with the gargoyles problem in that it results in them feeling like lazy decisions. As a result the “epic final battle” of the guards assaulting the cathedral just felt silly. So is this movie bad? No, not at all. In fact, the things that are good in this movie are PHENOMENALLY good. It’s a really good and complex story, the characters are mostly very deep, and the animation and songs are top notch. It’s just that those three bad things really drag the movie down to being just above average for me. Sure, it’s got flaws, but I’d still watch it again. If you’ve never seen it before, I highly recommend seeing it on Netflix or hunting it down. If nothing else, you’ll go away humming some awesome songs. This entry was posted in Movie, Reviews and tagged Demi Moore, Disney, Disney Animated Movie, Disney's Hunchback of Notre Dame, Jason Alexander, Kevin Klein, Quasimodo, The Hunchback of Notre Dame 1996 by richard0211. Bookmark the permalink. What are your Top 10 Disney movies anyway?